I read that happiness really comes in moments. Following fellow writer Tara Lynne Goth’s lead, I thought it would be a good exercise to jot down those moments in 2014. I thought I’d get to thirty and then have to check Facebook for reminders of my year. But I got to 56 without any prompting, and it was a happy moment when I realized I could go on and on about this! Sitting on the chaise lounge on my screened in porch reading a book with my babbling brook as background music. The moment I walked in the door to our twice yearly writing retreats to be greeted by the smiles and shrieks and hoorays of my fellow writers. Every moment I sat on the porch talking to Lois, Lynne, and Stacey on aforementioned writing retreats. 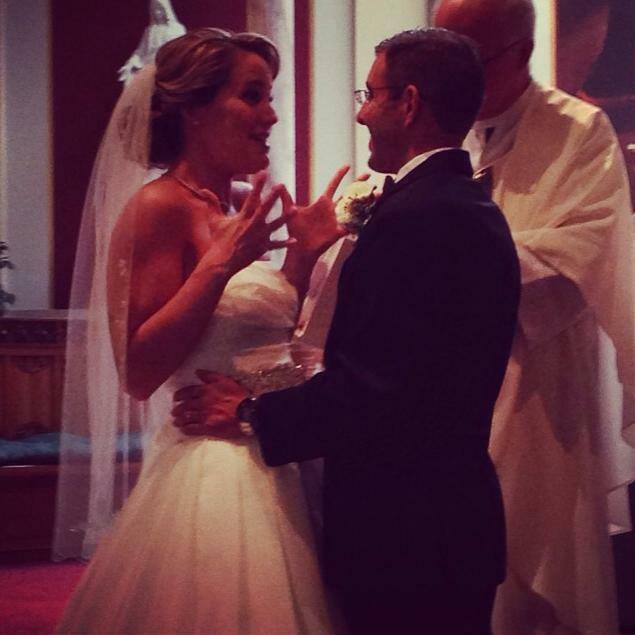 The look on Bethany’s face when the priest announced that she was officially married to my brother Jeffrey. Sitting on the patio at Atlanta Bread Company with Michael on the first warm day of spring, just after divesting myself of a pint of blood, having a conversation about joining his family on a Mediterranean cruise and deciding that we’re not the kind of people who hop a plane across the Atlantic and stay for only ten days. The moment we received the confirmation e-mail that our flights to Europe had been booked. 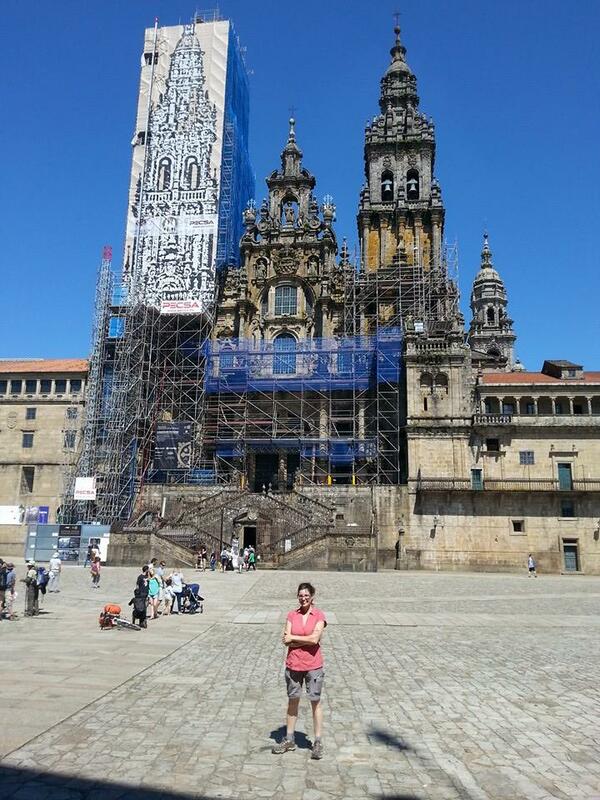 The moment I finally reached the Cathedral in Santiago–after having walked more wet and lonely days than I imagined I would. When I showed up at the hostel the first night of this year’s Camino to find the door locked and learning the other woman approaching was also looking to stay there, so I wasn’t alone in trying to figure out how to get into the place. 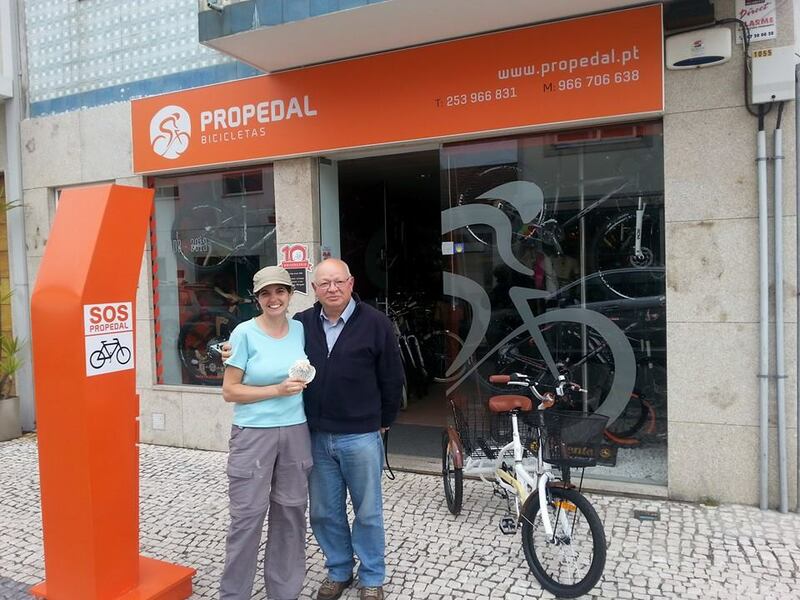 The moments I spent in the bicycle shop in Esposende sitting in comfy chairs talking to the owner (Manuel Rocha) with his employees and customers serving as translators, finally coming into contact with people who not only knew about the coastal route of the Camino Portuguese but had also ridden it and were instrumental in building its infrastructure. The moment Manuel gave me a scallop shell for my pack listing all the towns along the Coastal route. 10. 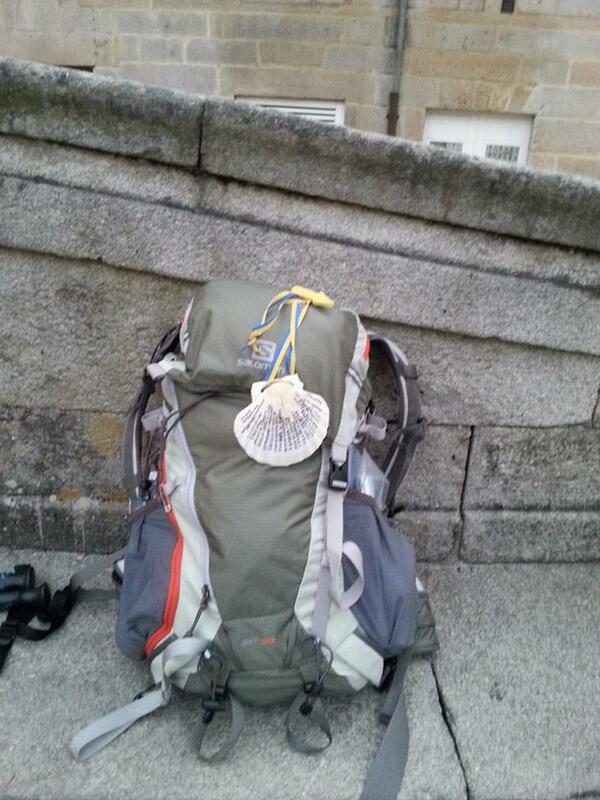 My Camino pack with Manuel’s gift attached. All the moments I used Google Translate (off-line!) to communicate with the Portuguese. The moment Michael realized his pack had been stolen and I had recovered it (which was one and the same moment). The moment I met Michael’s family for the first time in the KK Picasso Hotel in Barcelona. The moment I figured out how to use Facetime on my new iPad to talk to my parents. The first time I called my parents from France via Facetime. Seeing Rémy again—and how all those memories of my first Camino and his kindnesses along the way came flooding back. 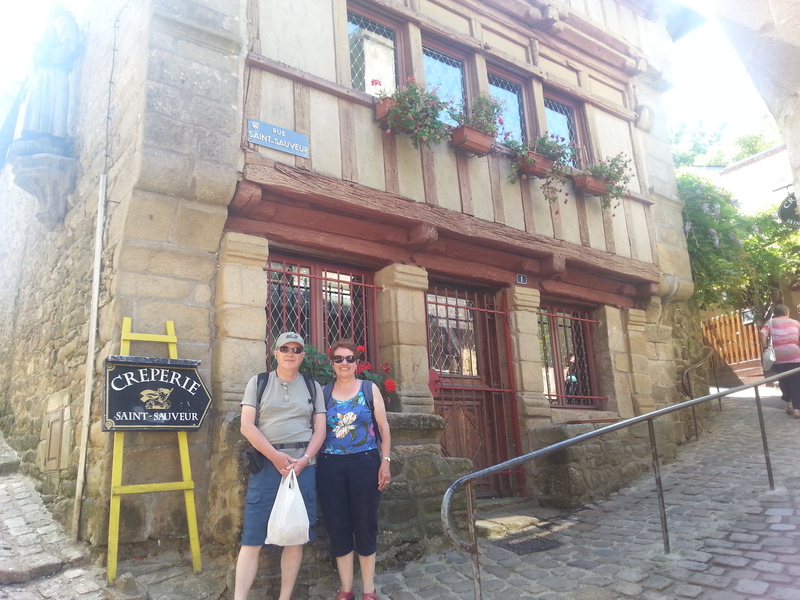 Meeting Rémy’s wife Jeanine–a wonderful woman who understands her husband’s need to head off alone for a few weeks each year to walk the French and Spanish countryside with strangers who soon become friends. The moment I realized that the first time in my life I’d be living with a boyfriend would be three days before he and I took off for three months in France. Every moment Michael did the dishes. 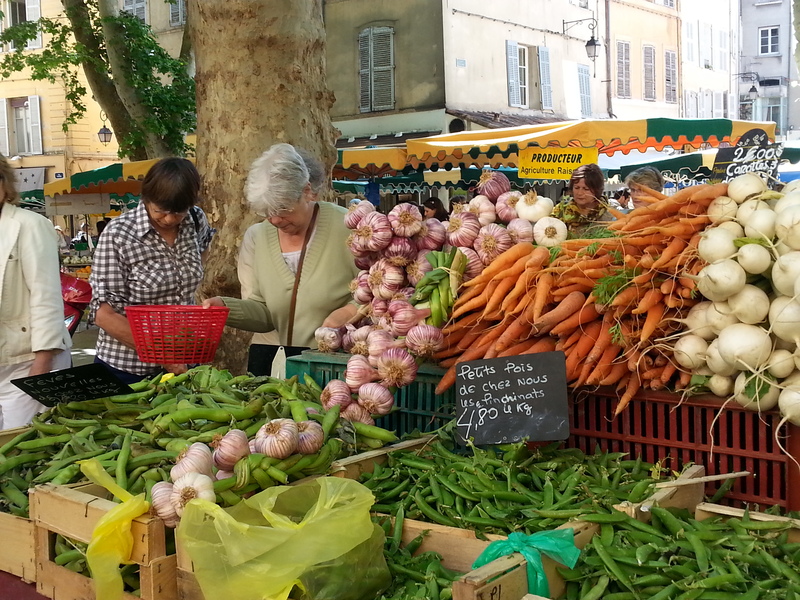 Every moment in the open-air markets in France. 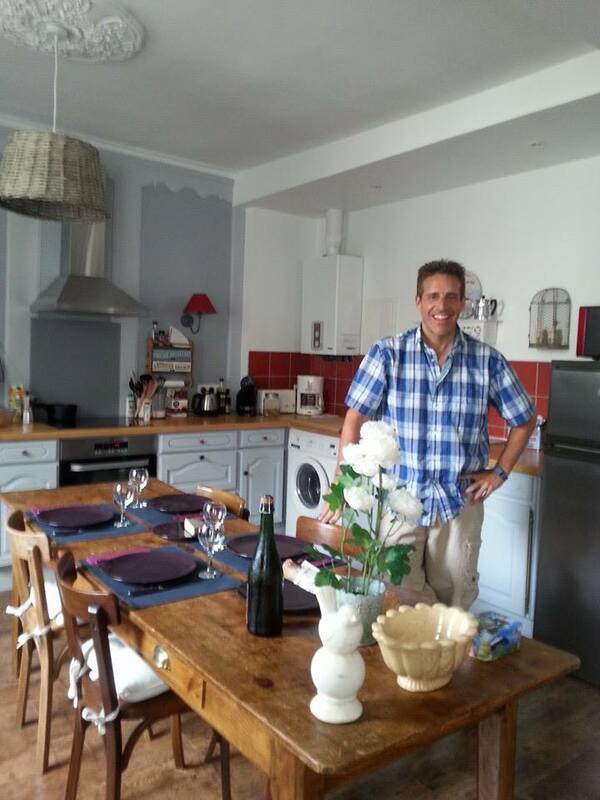 Every moment spent speaking French–especially on the Camino and with Remy and Jeanine. Every moment spent in Jane Henriques’ art class in Ceret, France. 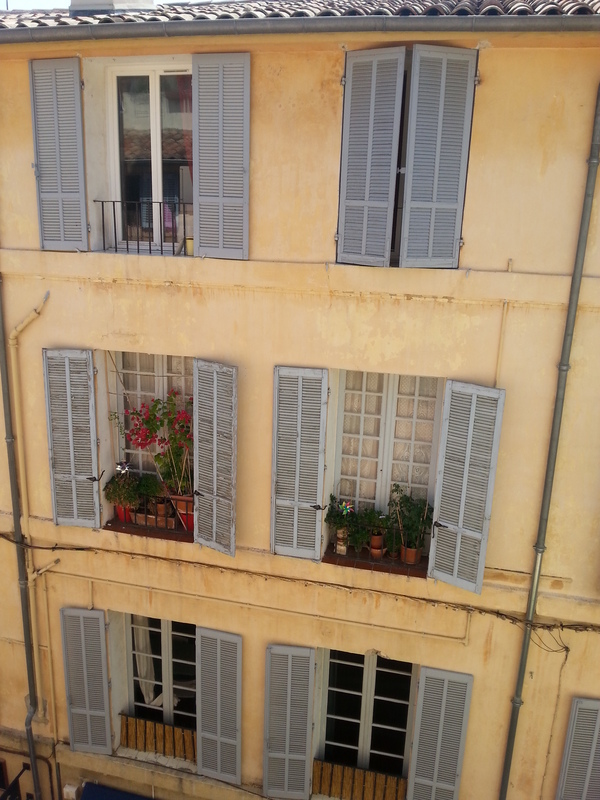 Every moment I opened the shutters in our apartments to see a French city street below me. Every moment I held the warm bread from the boulangerie in Aix. Every moment I ate the bread from the boulangerie in Aix. Moments spent sitting with Michael watching the people go by in Aix, Vannes, Ceret, Coulliere. The moment we saw Ben in the Asheville Airport–knowing we were finally home. The moments I spent talking to Laura and Chris via Skype while they sat in Laura’s hospital room. The first moment I stood in front of a class of foreign students and began teaching them English. The moment I learned the concept of student-centered learning and realized the next time I teach me and my students will have an even better experience. The moments each morning when I wake up to a man who is happy, and happy to see I’m awake (because he wakes up hours before I do). The moment I realized my boyfriend was bringing more bags to France than I was (a little selfish, I know). The moment Chris and Esther offered their home to Michael and I for the months after we returned to Asheville. The moment I realized Meg was going to get to live a dream she had told me about years ago. Every moment Ava and Bella screamed “Aunt Becky!” and ran to hug me. The moment I finished transcribing hours of interviews I did with my grandmother quite a few years ago. Every moment spent cooking with Mom the day before Thanksgiving. The moment Michael played the first few notes on his trumpet in the businesses in Schroon Lake for the Olde Time Christmas–the look on everyone’s faces as they stopped to listen. 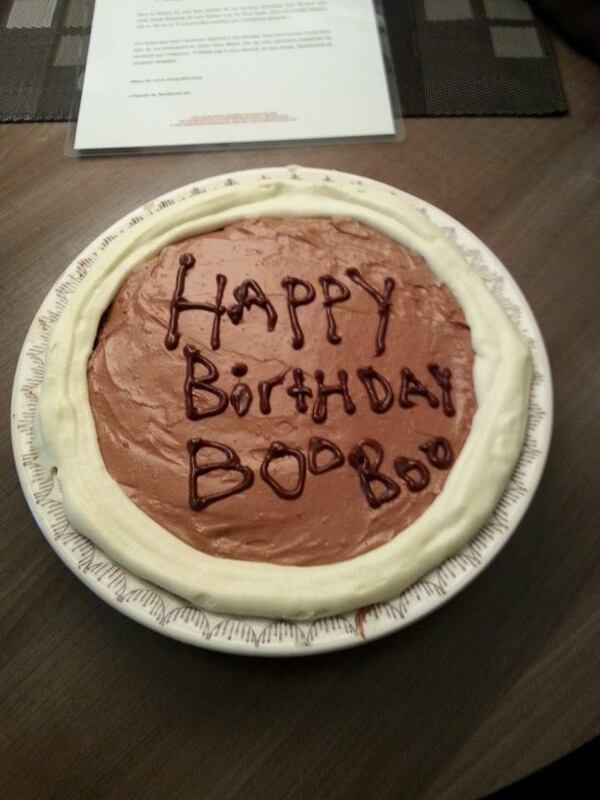 The moment Michael showed me the homemade Chocolate Creme Pie he made me for my birthday (which he managed to get to Montreal all in one piece). The moment Michael told me how he stopped at a Dunkin Donuts on his way to Montreal with the aforementioned pie and asked them to write “Happy Birthday Boo Boo” on it. The moment I tried Michael’s mushroom risotto for the first time (and every moment I ate it thereafter). 43. 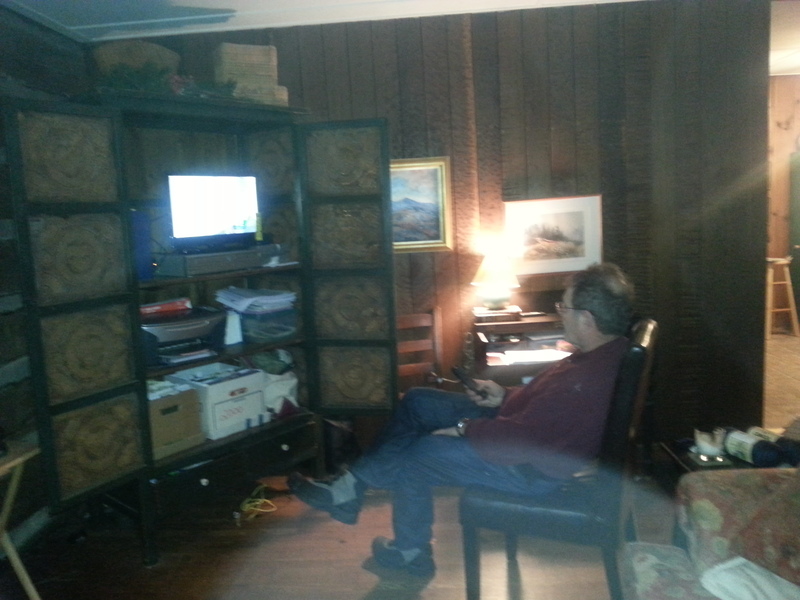 The TV was so small he couldn’t see it from the couch. So he had to move a chair closer. Every moment Michael made me laugh–and there are lots of them. 44. I may one day need counseling for how to live with a man who is always so darn happy. Every moment Michael made my mother laugh. The moments Jessica called to ask for my advice. Every moment I look at the birthday card from Jessica that sits on my dresser, the front of which says, “Thanks for being born.” Of course, I had no control over my birth, but still, I like the sentiment. Every moment someone says, “That Michael–he’s a good catch.” And I realize they’ve only seen a small part of what makes him wonderful. Every moment I spent writing. Every moment I spent teaching. Especially the moment at the end of a two hour tutoring session with a first-time student when she said how helpful I was and gave me a big hug. Having lunch with Bernice Ende— a woman riding her horses back and forth across America whom I read about in the local paper and e-mailed to say, “You sound awesome. I want to meet you.” And she said yes. The moment Liz called to ask me to crochet her some more wreaths for the knobs on her kitchen cabinets. The irony of the fact that the sister who used to call me “Granny” whenever I crocheted now calls me to request such things is not lost on me. Every moment spent in a class with Barbara Waterhouse. Every moment spent in a Celebration at the Center for Spiritual Living in Asheville. Every moment spent catching up with friends and family after my return from Europe. Every moment someone commented on a blog post I wrote. Brings a smile to my face every time. Oh wow. I could go on forever here. Thanks Tara Lynne for the idea. What a great way to start a Tuesday. A Gift for Me? Why–Thank You! The most popular question I get these days is, “Where are you?” The short answer: Schroon Lake, New York. Learning, yet again, to accept the generosity of others. In this case, a rent-free home with more bedrooms than I have holes in my head (visitors are very welcome!). I know many of you marvel at my ability to seemingly “stumble” into such things. In this case, however, I stumbled into generous parents. My own. Accepting their generosity, however, has had its ups and downs. “Where do you want to go next?” my father asked as we walked down Church Street in Burlington, Vermont, my mother window shopping not far behind us. “You don’t have any cash on you right now?” he asked, sounding incredulous. I took offense. “No. Nobody my age carries cash anymore.” His brows scrunched together as he tried to figure this out. How could I explain the convenience of ATM machines to a man who has never in his life used one? My mother piped in, “Lou, leave her alone. Just let her do what she wants.” She could see my frustration rising. “I don’t need your money!” I yelled and stomped off ahead of them to find an ATM machine. Now I’m not complaining that my father likes to give his children money. But as a twenty-something finally out on her own, I wanted to prove I could support myself. Which meant not taking money from Dad. My mother understood this. My father did not. “I just wanted to help you out,” my father said when I returned with cash in my pocket. I looked at my mother. She must have tried to help him understand. Couldn’t he just let this go? “I don’t need your help.” I said with a growl. “Lou, just drop it,” said my mother. But my father was never good at that. Years later a friend told me about the Love Languages.”You’ve never heard of this?” he said. “Give me an example,” I said. That night I googled “Love Languages.” And read and re-read the language called “Receiving Gifts”. That wasn’t me. I lived quite simply and got rid of stuff any chance I got. But you know who liked receiving gifts? My father. Whereas my mother has determined she doesn’t need anything and loves when we give donations in her name for Christmas, my father still likes getting gifts. I read on and learned the way you like to receive affection is also the way you like to give it. And that, right there, explained my father trying to give me money. It wasn’t that he felt I was helpless without him. It was how he showed he loved me. I cried. And here I was pushing away his love all the time. Shouldn’t we all be so lucky to have a dad who shows his affection this way? I told my mother about the book. “So the next time he offers me money, I’m just going to bite my tongue, and say thank you, and take it.” And that’s just what I did. And what I continue to do to this day. Dad, to his credit, has also changed his approach. When he gives me a fifty before I leave to go back home after a holiday visit he’ll say, “Now, I know you don’t need this . . . ” Or he’ll give it a purpose, “Here. The gas is on me.” Or “Get yourself a snack at the airport.” To which my mother says, “Or a couple drinks,” with a smile. Then Dad avoided talking to me about it altogether: after a three day visit to my home, I walked into the bathroom to find a bill sitting on the ledge below the mirror. He once hid a bill in the case for my iPad. Message received. No words needed.